Drive in morning to Holguin, 9:10 a.m. Jet Blue flight to Fort Lauderdale; or personal day in Santiago and fly to Miami 8:45 p.m. In Santiago, choose to stay at the newly renovated Imperial Hotel or at a casa particular (bed and breakfast). We are offering two price and lifestyle options, a very good conveniently located hotel, probably the Imperial, or a casa particular (bed and breakfast). Assuming 6 to 9 participants, expect to pay as a single traveler for ground costs about $2,300 in a hotel (less if sharing a room) and about $1,600 plus the room charge for a bed and breakfast in Santiago. The cost will be reduced if the group is larger. The registration deadline is May 2, 2019. Please complete this form as soon as possible: https://tinyurl.com/SantReg A $150 contribution confirms participation. If a deposit has been made, you participation should be permitted even if regulations change. Contributions will be returned if the trip cannot be made. * Learn the Cuban perspective on the base from the video "All Guantanamo is Ours"
The Americans decided to invade Cuba and to start in Oriente, where the Cubans had almost absolute control. They cooperated by establishing a beachhead and protecting the U.S. landing in Daiquiri. The first U.S. objective was to capture the city of Santiago de Cuba in order to destroy Linares' army and Cervera's fleet. To reach Santiago, the Americans had to pass through concentrated Spanish defences in the San Juan Hills and a small town in El Caney. Between June 22 and 24, 1898, the Americans landed under General William R. Shafter at Daiquirí and Siboney, east of Santiago, and established a base. The port of Santiago became the main target of naval operations. The U.S. fleet attacking Santiago needed shelter from the summer hurricane season, thus nearby Guantánamo Bay, with its excellent harbor, was chosen for this purpose and attacked on June 6 (1898 invasion of Guantánamo Bay). The Battle of Santiago de Cuba on July 3, 1898 was the largest naval engagement during the Spanish–American War, resulting in the destruction of the Spanish Caribbean Squadron (Flota de Ultramar). Resistance in Santiago consolidated around Fort Canosa, All the while, major battles between Spaniards and Americans took place at Las Guasimas on June 24, El Caney and San Juan Hill on July 1, 1898, outside of Santiago. after which the American advance ground to a halt. Spanish troops successfully defended Fort Canosa, allowing them to stabilize their line and bar the entry to Santiago. The Americans and Cubans forcibly began a bloody, strangling siege of the city which eventually surrendered on July 16, after the defeat of the Spanish Caribbean Squadron. Thus, Oriente was under control of Americans, but U.S. General Nelson A. Miles would not allow Cuban troops to enter Santiago, claiming that he wanted to prevent clashes between Cubans and Spaniards. Thus, Cuban General Calixto García, head of the Mambi forces in the Eastern department, ordered his troops to hold their respective areas. He resigned over being excluded from entering Santiago, writing a letter of protest to General Shafter. Program revised 1/19/19 and subject to change. Varela fled to New York, the first Cuban exile. There he eventually became Vicar General of the New York Diocese. His special apostolate was to New York's recently arrived Irish immigrants, who were as detested and persecuted in the 19th century as Hispanics are today in this country. Varela built the first Catholic schools for them (open to both sexes, for the first time); the first mutual aid society; the first orphanages; and the first parish to cater to their spiritual and material needs, in the notorious Five Corners section were most of them lived. The Irish clamored for Varela to be their bishop, but Spain vetoed his selection because Varela continued to agitate for Cuba's independence from New York, creating, through his patriotic writings, a distinctive Cuban consciousness and nationality. Martí himself journeyed to Varela's grave, then in St. Augustine, FL, to pay homage to "the man who taught us to think" and consecrate his work of liberation to him. In 1837, Varela was named Vicar General of the Diocese of New York, which then covered all of New York State and the northern half of New Jersey. In this post, he played a major role in the way the American Church dealt with the tremendous influx of Irish refugees, which was just beginning at the time. His desire to assist those in need coupled with his gift for languages allowed him to master the Irish language in order to communicate more efficiently with many of the recent Irish arrivals. While in the United States, Fr. Varela published newspapers and many articles on subjects such as human rights, religious tolerance, education and the need for the Spanish and English speaking communities to live in peace. In 1827, he founded the Church of the Immigrant in the impoverished Five Points district of Manhattan. Today, known as the Church of the Transfiguration, the parish continues to serve many immigrants. Fr. 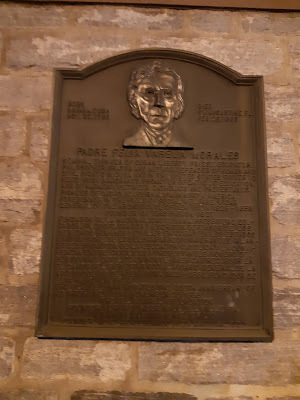 Varela became renowned in New York for his charitable works, his ministry to the ill during a cholera epidemic, his ecumenical spirit and respect for non-Catholics, his great devotion to the Mystical Body of Christ, and the missions he preached each year in anticipation of the Feast of Corpus Christi. In 1837, Fr. Varela was named Vicar General of the Diocese of New York, which at that time included the entire state of New York and northern New Jersey, as well. Proficient in languages, Fr. Varela learned the Irish language and was instrumental in helping the Irish acclimate to their new country at the beginning of the great migration of the Irish to the United States. The Spanish Governor in Havana, Francisco Vives, decided to apply Varela’s death sentence in New York, dispatching one of his thugs, el tuerto (one-eyed) Morejón of the Havana police to assassinate him. By that time Varela had built a loyal following among his Irish parishioners, who were no friends of colonialists, and they foiled the plot by warning Varela and intimidating the would-be assassin. A one-eyed Spanish-speaking stranger wandering around an Irish neighborhood in lower Manhattan would have been noticed. In any case, Morejón returned to Havana, presumably without earning the 30,00o pesos Vives had offered him. Two observations from Hernán Guaracao, a major on line publisher for the Latino community in Philadelphia, originally from Colombia. He brings Varela into the present. But his greatest achievement in life was not this advocacy for the independence of his homeland, written out in that journalistic enterprise he launched in Old City Philadelphia, but what he did in the following 30 years in New York City, where he moved to lead a life of charity in defense of the poorest of the poor, the undereducated immigrants coming to America in the first half of the 19th century, mostly from an island called Ireland. Does anybody remember the “Kensington Riots,” when the Catholic Irish confronted the backlash of resistance to their presence they found in Philadelphia in the 19th Century, either because they were poor, or they were undereducated, or they were simply “different”, on top of being catholic, exactly like a good number of Latinos are today? The life of Father Felix Varela y Morales, when properly publicized and well understood, can be a major point of reference to the current dilemmas of immigration into the United States. And it can be a call, from the shrine of the memory of a man one step away from being declared a saint by the Catholic church, for the moral responsibility many leaders with power and influence, some of Irish descent, must feel today. In the profound immigration crisis of today, Varela life’s example can be just an inspiration for action in view of the millions that have come and are now trapped by obsolete laws that keep many on the run, or stigmatized because of the negative images propagated by a society of immigrants that have been harsh with their own kind.